A minimum of moving parts and simplicity of design results in long term, trouble free operation. A low power solenoid assembly provides direct action in the 1/8″ models, and is used as a servo in the larger pilot operated versions — in piloted models air pressure is applied to a sliding spool which opens and closes the pneumatic control ports. Some of the coils meet intrinsic safety codes — see specifications below. Our spool design features low-friction operation within annular seals. It has a self-cleaning wiping action to minimize the effects of potentially contaminated air. This contrasts with other competitive designs which have delicate sealing surfaces, plus many intricate parts. Size for size, this efficient design makes for some of the highest flow ratings in the industry. Ambient Temperature -4 to +176°F / -20 to +80°C except where upper limit is dictated by hazardous location certification. Body Material Standard: black anodized aluminum alloy. Options: 316 stainless steel, brass. Spool Material Standard: hard anodized aluminum, PTFE impregnated. Options: silicon, fluorosilicon, natural rubber or styrene for low temperature operation down to -40°F (-40°C), viton for high temperature operation on certain models. Coil Housing Rated NEMA4X / IP65, materials application dependent. NEMA7 / IP66 options available in some cases. Cable Entry Standard: M20 thread. Options: 1/2″ NPT thread, or 1/2″ NPT adapter to fit M20 thread on terminal box type coils. Power Consumption 0.4 to 5W, application dependent. Wire Termination Flying leads, screw terminals, plug & socket (may be application specific). Coil assemblies are available to meet different applications. However, valves for use in hazardous locations usually require a specific coil assembly chosen during the approval or certification proces and this will often dictate the operating voltage. The most common choices are listed below — consult Exloc for others. Zinc alloy with epoxy coating. Zinc alloy with epoxy coating. Integral cable. Stainless steel with epoxy coating. Threaded entry. Zinc alloy with epoxy coating. Threaded entry. Two port, two position. Simple on-off function. This is not a common requirement in pneumatic control applications. If it is required, select a 3/2 valve type and plug the exhaust port. Three port, two position. Most commonly used with single-acting spring-return cylinders to alternatively apply and exhaust air pressure. Five port, two position. Used with double-acting cylinders required to take up one of two extremes of travel under air pressure. Five port, three position. Used with double-acting cylinders required to be driven to one of two extremes of travel or be held in mid-position. There are two sub-designs in this category which permit exhaust air to be either held or released in mid-position. 3-way (3/2) valves have a single pressure port for connection to an air cylinder or actuator, an air supply port, and an exhaust port. Both single and dual solenoid designs are available. The pilot operated versions may be built with an internal pilot air passage from the main air supply port (most common), or with an external pilot air connection. Normally-closed versions shown. Ask us for normally-open codes. 4-way, two-position, (5/2) valves have two pressure ports for connection to double-acting air cylinders and actuators, two exhaust ports, and a common air supply port. Both single and dual solenoid designs are available. Pilot operation is accomplished with an internal air passage from the main air supply port, or alternatively with an external pilot air connection(s). 4-way, three-position, (5/3) valves have two pressure ports for connection to double-acting air cylinders and actuators, two exhaust ports, and a common air supply port. They employ dual solenoids, and have spring return to center with a choice of exhaust port status in the mid-position as shown in the schematics below. Pilot operation is accomplished with an internal air passage from the main air supply port, or alternatively with an external pilot air connection(s). All ports sealed in mid-position. Most of the remote mounting valves detailed above are available for mounting on a sub-base which becomes the termination point for piping. The valve proper can then be removed from the sub-base without breaking the pipe connections. An air shut off valve is incorporated into the sub-base for this purpose. For stand-alone valves using this option specify Valve Body Style Code T.
Multiple valves mounted on sub-bases can be bolted together to create a manifold with common air supply and exhaust connections. Pipework is reduced, and space saved. Main air supply and exhaust ports are duplicated at each end of the manifold for convenience, and are sized appropriately. Provision to add valves to expand a system can be made at the outset by including extra sub-bases fitted with blanking plates. Banks of up to ten valves are possible. Specify Valve Body Style Code V and the number of valves to be ganged together.Example shows three Model E2318 valves manifold mounted. 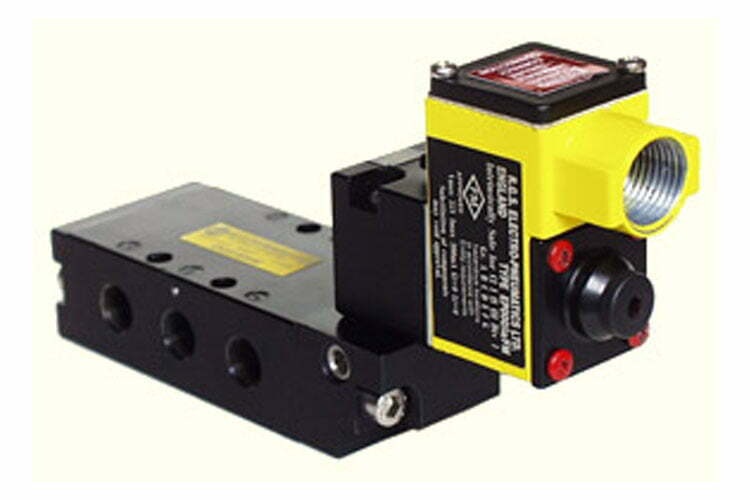 We can also supply solenoid valves engineered to the CNOMO standard for direct mounting to actuators.